We returned to the trail rested and relaxed from our time in Big Bear with family. But as it turned out, we couldn’t leave the family behind! 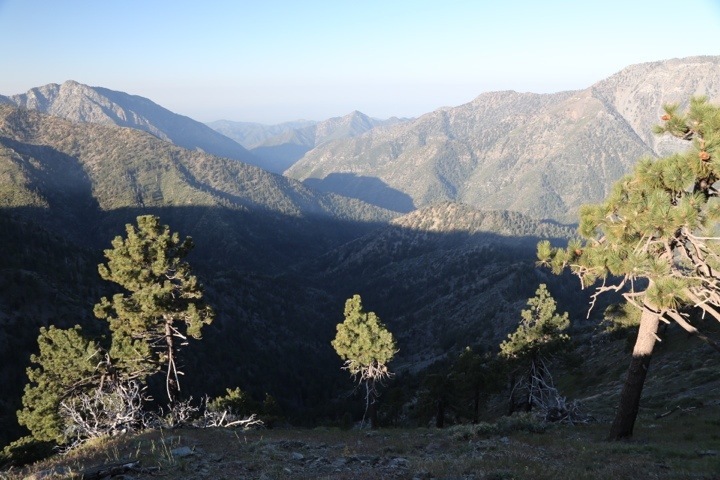 Five of Anna’s relatives joined us for 13 miles of the Pacific Crest Trail out of Silverwood Lake. We had a great time sharing the trail with them, and trail names soon emerged: Alex was Moon, Peter was Crow, Joe was Fire Ant, Cindy was Lulu Lush, and Jim was either Twinkle Toes or Big Load, though he rejected both. We should also mention that right before taking our rest days, a fellow thru hiker, Dancing Feet, suggested Anna should be named Morning Glory. 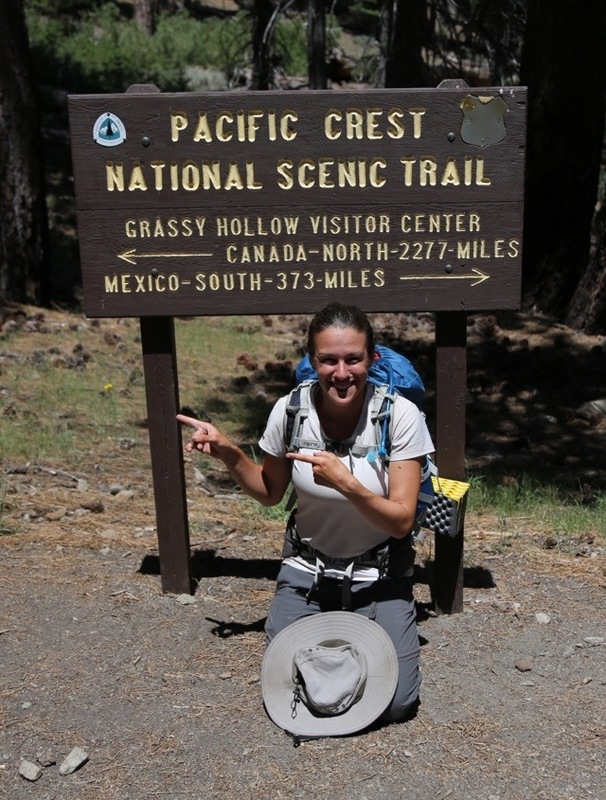 The name would fit well because Anna wakes up early, is upbeat, and likes to identify wildflowers along the trail. We both feel the name is pretty good, but not perfect, so Anna will await another trail name suggestion. 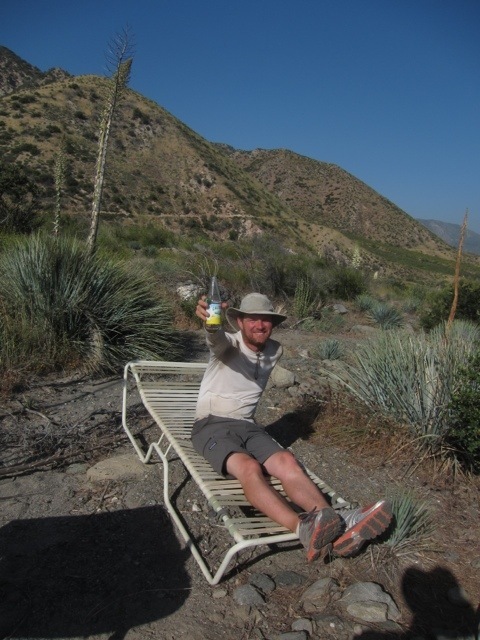 After we parted ways with the family, we continued on until we reached a water cache at Swarthout Canyon Road. This spot was amusing to us because of the furniture, which provided for some prime desert lounging. We camped nearby, resisting the urge to sleep on a lounge chair. After some serious climbing in a hot, exposed burned area, we came upon the dreaded poodle dog bush. Poodle dog has been known to send unwary hikers to the hospital as its poison is much stronger than poison oak or poison ivy. Luckily the bush gives off an unpleasant odor, which we smell before we encounter it on the trail. At times poodle dog almost covered the trail, and we were forced to perform the intricate twisting and turning maneuver known as the poodle dog ballet. 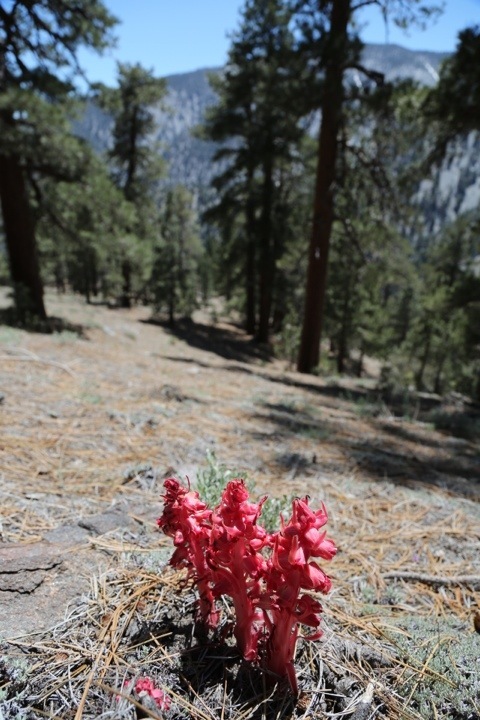 Emerging from the thicket non-poodled, we were excited to find a few fiery red snow plants. This plant contains no chlorophyll and instead consumes dead organic matter to survive. It looks alien compared to all the other green leafed plants nearby. After a 17 mile dry stretch, we arrived at a small, startlingly cold spring. 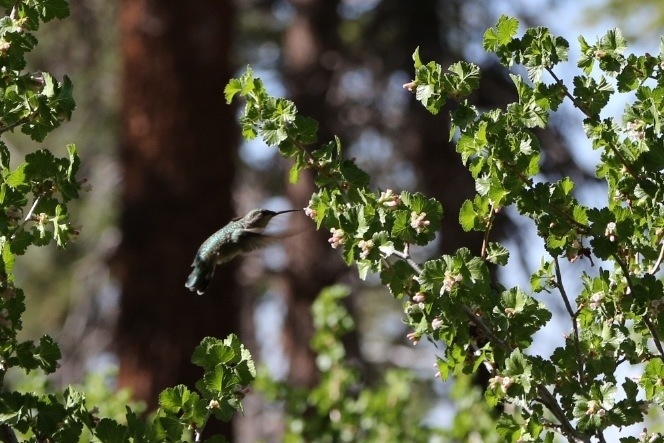 There we found many birds, most notably hummingbirds, which were feasting on nearby blossoms. Reaching a good stopping point, we reflected on a day which had included 20 miles of walking and 4800 feet of elevation gain, both new records for us. 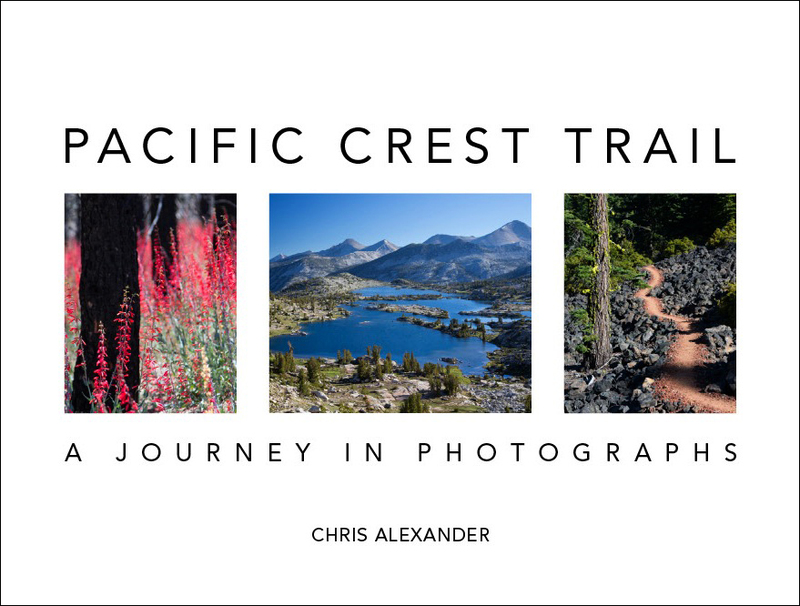 The day also ended our first month on the PCT. There was much to celebrate, and we rewarded ourselves the best way we knew how: with some serious sleep. Our morning walk to the highway was fantastic. As the sun rose, shadows played on distant mountainsides. When we reached the highway, we stuck out our thumbs and waited. At first we had no luck due to the low traffic volume on a Sunday morning, but eventually a kind soul ferried us to Wrightwood. On arrival, we ate all we could handle at the Grizzly Cafe, then hit the hardware store to buy a bit of rope for the tent. At the grocery store we purchased enough food to get us to Agua Dulce. Outside we met Sunset, who’s a triple crowner — he’s completed the AT, PCT, and CDT. He proved to be a profoundly friendly South Carolinian with plenty of good stories. He was soon devouring a half gallon of chocolate ice cream. 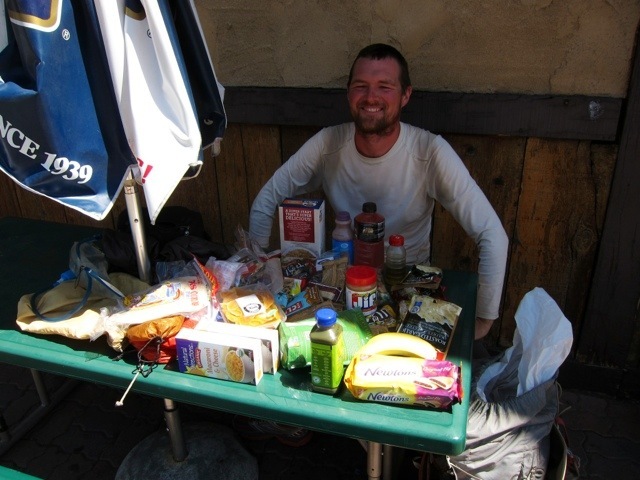 Provisioning complete, we hitched back to the PCT from Wrightwood. A couple miles in, we set up the tent and awaited the solar eclipse that was forecast. As the moon crossed in front of the sun, everything grew darker, as it would at sunset, but the light was cooler and more blue than it would be at sunset. The world looked a bit off kilter. 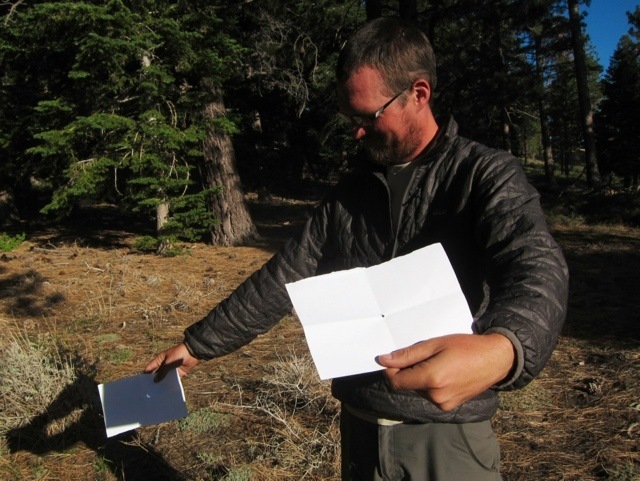 We viewed the crescent sun through a pinhole on a sheet of paper. It’s safer that way. As sunset approached, the eclipse subsided, and the sun grew brighter again, but just briefly. By then we were ready to call it a night. Are there Morning Glories on the trail? If so, I LIKE that name for Anna! You hit the nail on the head as to why I’m not a huge fan of the name Morning Glory. There are many varieties, but the most common type that people think of doesn’t grow in California. Morning glories are also considered an invasive weed in some areas because they smother out native plants. The name suggestion by Dancing Feet was a nice thought, I just don’t think she realized that it’s an invasive species. 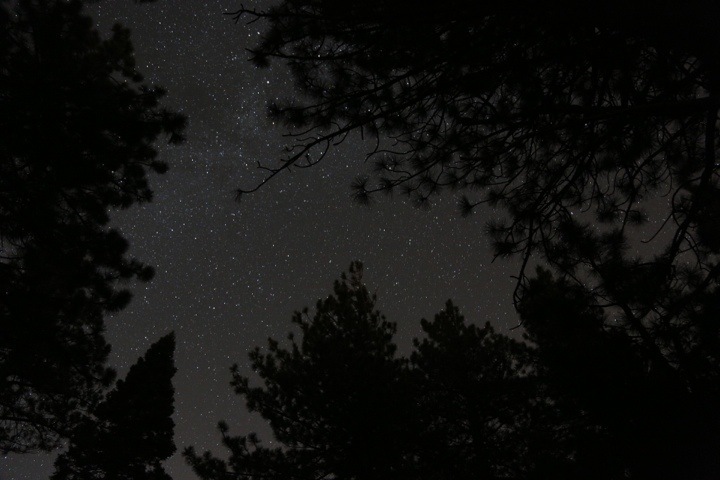 Enjoying your blog, love the night sky photo! A few years back hiked OR/WA with my wife. 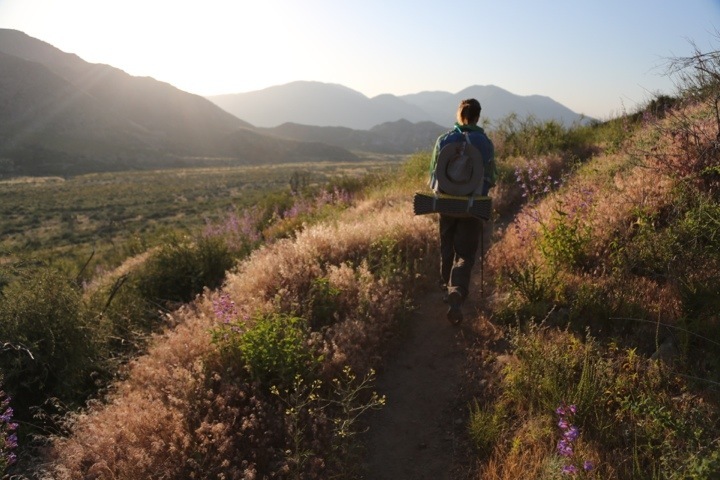 Dream about hiking CA in the years ahead… In the meantime, love living vicariously through the two of you! Thanks, so glad you like the photo. I had to wake up to capture that because we go to sleep before the stars come out. We are really looking forward to the Cascades because neither of us has hiked there before. It’s our pleasure to share our experiences. Cheers! 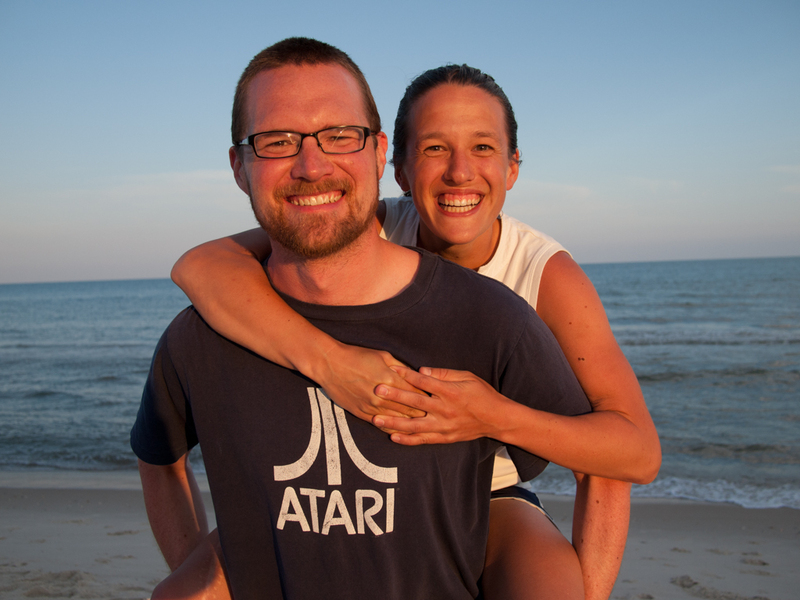 Anna and Chris — I’m loving your blog! Thanks for sharing your journey with us! I’m sure your family enjoyed the hike — I’m excited to see Pete and Alex soon and find out more from them! Chris — your pics are awesome — love the pic of the night sky with all the stars! any idea how the poodle dog bush gets its name? Hey Tricia, Thanks for the kind words. We are kind of baffled as to the name poodle dog bush. The leaves grow in a circular tower and the old dead leaves stay attached to the woody stalk, so the best we can guess is that each leafy tower looks like a furry poodle dog leg. So, Anna, was your family able to keep up with you for those 13 miles? And Chris, when your pants start falling off as you turn to skin & bones you’ll need red suspenders & then, with that beard you’ve got going, you’ll be the True Mountaineer! Love. Yes, they kept up quite well! It helped that all of them were in good shape. Suspenders are a good idea, and I haven’t seen any on the trail yet. They might interfere with backpack straps, but they would be quite the fashion statement. Poodle dog bush? Great name. What does it smell like? It’s hard to describe the poodle dog bush smell. After discussing, the best we came up with is a sweet skunky smell. It’s pungent. We love following your journey! Thank you for sharing it all. Laura and Brian leave for Alaska this weekend. Hopefully they will have tales to share as well. Auntie M and Bob, glad you are enjoying the stories! Very cool that Laura an Brian chose Alaska as their honeymoon destination. It will be beautiful. We definitely want to explore Alaska sometime soon so we’ll have to ask Laura and Brian for recommendations when they return. I have a nickname for you, Anna – AnnaBanana! Thanks Mom, we are happy to oblige! And for every photo we post, we see so much more we don’t capture, but at least we can convey some of the good parts. It’s amazing how many experiences we have out here every day. He also reports that his friend at work, upon hearing of your total mileage, said that your total mileage is about the same distance as if you had walked from Philadelphia to Niagara Falls. That is quite a piece!!!! It is really strange being so close to LA. Yesterday we passed through a campground where they were getting ready to film a movie or TV show. It was bizarre because after that we were right back in a forest and you’d never know we were so close to a huge metro area. Some of these hot desert days we could use that mist from Niagara Falls to cool off! Instead I settle for dunking my hat in a cool creek — if we can find one. It’s great to hear we’ve made that much progress though. Almost to the Mojave now. I’m loving your blog. Thank you so much for sharing your journey. I’m amazed at the distances you can travel in a day! I love all your photos each other and of the mountains and the trail. The stars in the night sky photo are awesome. Happy walking! Thanks so much Mary, we are glad to have you reading and we love to share the journey. We are always either walking, eating, sleeping, or blogging out here, and we wouldn’t have it any other way! California has such an amazing variety of ecosystems, and we get to sample almost all of them, sometimes a few each day. Sometimes we will come around a bend and just go, wow. We are so often surprised! I envy you with the ability to see the eclipse. Also loved the picture of all of you gathered together with Anna’s relatives. What a treat to have them join you for a smidgen part of the trail. Keep safe. Thanks Kathy, the eclipse was sweet, and sharing the trail with relatives was even sweeter. Having a great time out here! We met just before Fuller Ridge and we chatted about your move to Fort Collins and about Sierra hiking. Then we met again under the bridge at Deep Creek, where I didn’t at first recognize you without your packs on. 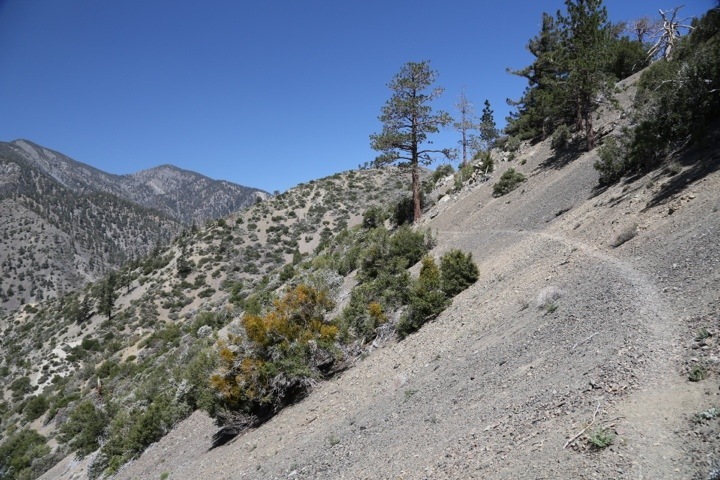 My hike ended at Wrightwood, about a week earlier than I had hoped – due to an ankle sprain. I am glad I have discovered your blog and I will enjoy following you to Canada. 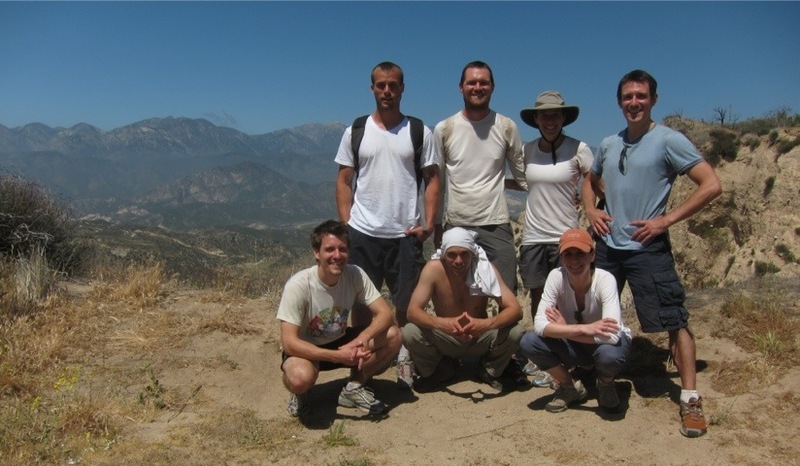 The photos are great, as is the commentary on your hike. Best to you both. Thanks very much, Backpax! Sorry to hear about your ankle, but it was great to meet you and chat. 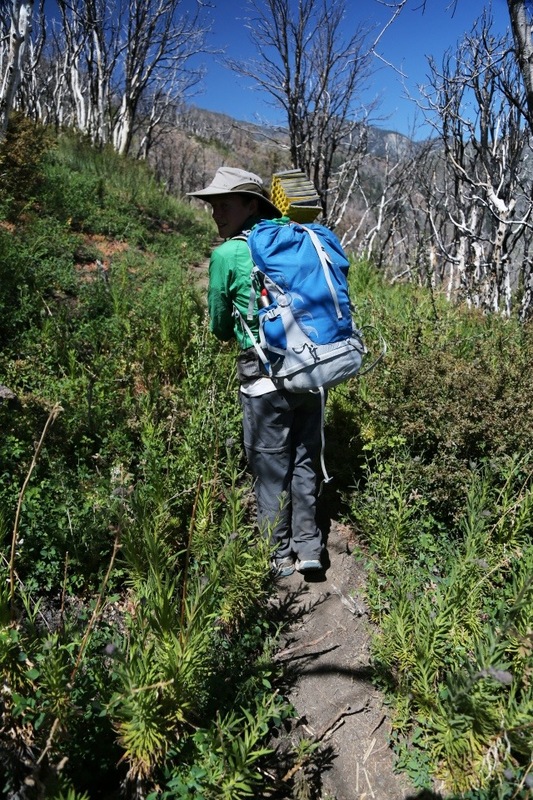 Thanks for your thoughts on the best places to go in the Sierras. We’re glad you’ll be following along. Comment whenever you’d like! Thanks Charles, I was excited about that hummingbird. I remember Ang has a nice hummingbird photo too. We are stoked (I can say that since we are still in Cali) to find our legs and feet getting strong enough to do that kind of mileage and climbing. We will need that strength in the Sierras. Colorado’s mountains will be a great way to stay in shape after the hike. We don’t want to get soft!